The City of Paris returned its water services to public ownership after 25 years of privatisation. They have just released a report saying that the price for drinking water in Paris will go down 8% as a result of cost savings after remunicipalisation. As a true public service provider the city returns the profits from water to the citizens. It is the first time since 1980 that the price for water has reduced. Over the period 1980 – 2009 the price had gone up each year, totalling a price increase of 480%. Inflation over the same period amounted to 250%. Taking into account that costs for water would have increased the same as inflation it seems that profits for the water companies over the period 1985 – 2009 have doubled. Well done Paris by returning the profit to the citizens who obviously have been paying too much over the past 25 years of privatised water supply. Those who argue that Scotland's water should be privatised - take note! Interesting story in the Guardian that shows that the practice of sacking civilian staff and backfilling their posts with police officers is now happening in England as well as Scotland. According to a leaked memo from Warwickshire police, officers are being taken out of frontline roles and moved to cover the "back-office" functions of civilian staff who have been made redundant. The decision by Warwickshire police authority – one of the smaller forces in England and Wales with 1,800 officers and staff – to draft up to 150 frontline officers into civilian desk jobs is expected to be followed by other forces grappling with a 20% cut in their Whitehall funding. In Scotland we are seeing this on an almost daily basis. It is common for memos to staff to say, "as we no longer have civilian post X, police officers Y will now do this task". The so called 1000 extra police officers is being exposed for what it is - a political con-trick. Good to see an audience member at last night's STV leadership debate asking a question about this. Not surprisingly, Alex Salmond did not respond. On a related cuts theme have a look at this Martin Rowson cartoon in the Guardian. Absolutely brilliant! A few daft anarchists couldn't do a fraction of the damage the Con-Dem coalition are doing to the fabric of our society. Yesterday evening I participated in a round table discussion hosted by Holyrood Magazine and the Freedom of Information Commissioner. The idea was to bring together practitioners, journalists and public authorities to discuss the practice and reform of our freedom of information arrangements in Scotland. My own experience is that the Freedom of Information Act has changed the culture of information management in public authorities. Far more information is routinely disclosed and there is a much greater willingness to respond promptly to specific requests. Whilst that was generally accepted, journalists felt that requests were still dealt with too slowly and the loopholes in the legislation exploited when the information might lead to an embarrassing story. One outcome of the legislation has been the creation of freedom of information specialists within public bodies. They have an important role in managing requests, chasing replies and raising awareness within their organisation. There was an interesting discussion around the relationship between the role of the press office and FoI. My own view is that FoI staff generally promote a culture of disclosure rather than simply policing the system. Finally, we discussed the idea that fees should be introduced for FoI requests. Whilst it is understandable that public bodies should want to maximise income in the current financial circumstances, there was little support for fees. In my view FoI is an essential element of a democratic society and democracy costs. So charging is a no in my book. A report of the full debate will appear in a future edition of Holyrood Magazine. There is an absolutely must read exclusive by Rob Edwards in today's Sunday Herald. Largely based on the work of Tommy Kane at Strathclyde University, it shows that the taxpayer is spending £4.8bn for sewage plants that cost £600m to build. You might say well that's not new the cost of PFI, and the water schemes in particular, have been widely condemned in the past. What's new is the scale of performance failure and the concerns that Scottish Water has over compliance risk, including pollution limits. Their performances have been so poor that Scottish Water has imposed financial penalties totalling £7.5m on PFI operators. Scottish Water is now have to spend many more millions putting the problems right. These are the very same companies that want to take over Scottish Water and run it for profit. Supported by the CBI and the business lobby in Scotland whose best defence is "PFI had not been perfect". You can say that again! Really amazing turnout yesterday at the TUC march for the alternative in London. Long day for most of the Scots who made the journey. 4:30am for those on our train and back by 1am, but everyone I spoke to felt the effort was worthwhile. Our train arrived late, but we managed to squeeze into the march and got to Hyde Park in time for the main speeches. I thought all the speakers got it about right. Sharp message with a real focus on the alternative to the Con-Dem coalition policies that are wrecking the country. We then got a drink and as we made our way back to the tube for our train there were still people starting the march. That's nearly five hours later! On the right hand side of the UNISON Scotland banner were a group of pensioners who decided to come when they were told their day centre opening days are to be cut. On the left a group of young children with their family protesting about cuts in their school. Far from the 'usual suspects' and this is before the really big cuts fully kick in. I was pleasantly surprised how so many people understood that there is an alternative. In particular cracking down on the tax dodgers. Now we have to keep plugging away at every level until the millionaires in the Cabinet get the message that their tax dodging pals have to pay their fair share too. I took part in a debate this week over the hydro nation concept following the Scottish Government consultation. A number of private sector interests arguing against the idea or at best making the case for a market led solution. There was much misinformation about an earlier hydro nation concept - the establishment of the North of Scotland Hydro-Electric Board (NOSHEB) and the post-war construction programme that brought affordable electricity to the Highlands. It is the electricity infrastructure that NOSHEB put in place that made it possible for the Highlands to use information technology today to offset the regions remoteness. The driving force was Tom Johnston (Wingy Tam as the workers called him), firstly as a politician and then as Chair of the Board. He got the development programme going in wartime despite opposition in Parliament, partly by doing a deal with Churchill, who became an unlikely sponsor of a new nationalised industry. Then he faced up to the Highland landowners, the nimby's of their day, who opposed any development that might increase wages and encourage the workforce off the estates. There was no market solution here, just a visionary politician and good old fashioned state planning. However, the real story of hydro power in the Highlands is of the people. In the context of recent immigration to the Highlands from Eastern Europe it is less well known that much of the labour force for the early hydro schemes were displaced persons. It is Germans, Poles, Latvians and many others that we have to thank for electricity in the Highlands. These were the 'hydro boys' who at the first big scheme at Sloy worked for half-pay to prove their commitment to their new country. Many workers paid the ultimate price with their lives. There were no safety laws or independent inspections. Workers were encouraged to cut corners and work long hours through the incentive of bonus schemes. This is another current day analogy, with this week's announcement by the Chancellor that our safety laws are to be downgraded and the HSE budget cut back by 35%. Whilst there are some individual monuments to those who died, there is no monument anywhere in the Highlands to commemorate all the men who gave their skills, their strength and their lives to bring power to the Highlands. As Emma Wood states in the final chapter of her book 'Hydro Boys'; Tom Johnson would no doubt agree with those of us who reject government confidence in the free market. "Whatever businesses may say, their primary responsibility is to their shareholders and not to the natural environment or future generations. It is for these future generations' sake that we must have a proper energy policy now to regulate the activities of energy producers and consumers alike." That would be a fitting legacy for the hydro boys. More dismal news in the UK Budget today. The Chancellor has by passed the chance to scale back the savage public spending cuts, condemning the economy to long-term low growth and high unemployment. He quietly slipped out the downgraded growth forecast for 2011 from 2.1% to 1.7%. The result of his CSR announcement last October. But don't worry, we are going for growth by tax cuts for big business. Apart from the fact that there is not a scrap of evidence that Corporation Tax cuts do anything for jobs and the economy, most companies don't pay the full amount anyway. They move cash around tax havens aided by our weak tax regime. Our members pay their taxes through PAYE, the rich and big business dodge their responsibilities to society. See Richard Murphy's blog for the low down (and it is very low) on the Chancellor's latest handout for his tax dodging pals. He points out that large companies can now shift large amounts of their profit offshore and pay just 5.75% on them - a further tax cut for big bsuiness. It also encourages multinational corporations to move functions and employment out of the UK - not bring them to the UK. Which is in itself amazing. And then we get de-regulation. Including the implementation of Lord Young's report on health and safety. We already know that the HSE is planning to cut unannounced inspections by a third. Put simply, more workers will be injured and die as a result of this decision. The Chancellor also failed to mention a further piece of bad news - the OBR anticipates an additional 130,000 people will be unemployed in 2012. Youth unemployment is particularly worrying, with nearly a million under-25s out of work – more than 400,000 in excess of six months. A budget for jobs and growth? I think not. Today is World Water Day when we highlight the United Nations resolution on the Right to Water and Sanitation. On 28 July 2010 the UN General Assembly voted for a resolution which declares that access to water and sanitation services is a fundamental human right. Although this resolution has no binding authority, it expresses global consensus, with the shameful exceptions of a few EU member states. Governments should dedicate the necessary resources to ensure universal access to water and sanitation at an affordable price. Most governments can afford to do this, yet choose not to. This is a political problem, not a market problem. The EPSU has repeated its support for the European Pariament declaration to keep the management of water resources not subject to internal market rules. It also states its support for public ownership and management of water and water utilities. Privatisation has induced inequalities and exclusion and has often led to steep water-rate hikes, water-service disruptions and unaccountable management. A recent trend is a return to public management of water services including major cities like Paris. Water and sanitation services are a fundamental responsibility of governments and must not be outsourced for private profit. Whilst we have a public service in Scotland it is constantly threatened by contractorisation, costly PFI schemes and a well financed business lobby. Water and sewage are vital public services that our families and communities depend on. Water is life. I was at Scottish Labour's Spring conference on Saturday. More a pre-election rally than a real conference, but none the less an important opportunity to fire up the troops for the coming campaign. Keynote speeches from Ed Miliband and Iain Grey. Ed Miliband in the morning putting the election in a UK context, stressing the importance of a Labour Government in Scotland as a key element of resisting the Tories and their damaging policies. Iain Grey's speech was well crafted and set out the main themes of the election campaign. He took his audience back to the 80's when the Tories were last in power. Reminding everyone of the lasting damage to Scotland's communities. He pledged his government to do all they can to minimise the damage Thatcher's children will try to do to Scotland today. There may not be much cash, but devolution means that we can resist the dismantling of the NHS, schools and councils that the Tories and the Lib-Dems are planning in England. The focus will be on jobs and the economy, particularly young people, so we don't write off another generation as Thatcher did. He even used the 'S' word twice! When you take this speech with Alex Salmond's speech to the SNP conference, the main parties in Scotland clearly intend to focus on the Tories. You might think this is fairly strange given their limited electoral strength in Scotland. However, this campaign is looking like a pitch on who is best placed to defend Scotland against the Tories at UK level. At lunchtime I attended the Labour Yes launch for the AV referendum. UNISON hasn't taken a position on this, rightly recognising that we can't afford to be distracted from our primary campaign against cuts in public services. A lot of Labour activists are torn between the desire to deprive Nick Clegg of the main reason for selling out to the Tories, and their instinctive recognition that AV is probably a better system than First Past The Post. The best argument I heard in favour was that AV forces parties to campaign more positively, because attack politics makes it less likely to attract second preferences. This could lead to a less tribal approach to politics, something I personally would welcome. Last night I was at a showing of the new film Even the Rain at Glasgow University that UNISON sponsored. The showing was organised by Take One Action, Scotland’s global action cinema project. They aim to link audiences, movies, campaigners and communities to inspire shared responses to issues of global concern. I am a big fan of this approach to campaigning as it takes issues like water privatisation into communities in an entertaining way. The story of the film revolves around a filmmaker Sebastian (Gael García Bernal) who arrives in Cochabamba, Bolivia to make a film about Colombus’s first voyage to the New World and the subsequent subjugation of the indigenous population. He wanted to focus on the experience of of Spanish monks who opposed the treatment of the natives. His producer Costa (Luis Tosar) has chosen Bolivia, the poorest country in South America, because it makes sense economically. Extras are willing to work long hours for just two dollars a day. Sebastian casts local man Daniel (Juan Carlos Aduviri) in the role of Hatuey, the Taino chief who led a rebellion against the Spaniards. Daniel is also one of the leaders in the demonstrations against the water price hikes driven by a US water corporation. Intercutting footage of Sebastien’s film with recordings of the actual protests, creates a powerful juxtaposition between the historical and present day events. After the film we had a short debate on the issues raised by the film. Not surprisingly those who advocate water privatisation in Scotland and elsewhere declined the invitation to debate the issue. More than one billion people worldwide do not have access to basic water and sanitation services. As a consequence a child dies every 15 seconds from diseases related to low water quality. The UN has declared water as a basic human right but that doesn't stop the water multinationals from profiting from it and exploiting communities across the world. Aided and abetted by institutions like the World Bank, IMF and others. The good news is that communities, like those shown in the film, are fighting back and winning. Even in Europe cities like Paris are returning to a public service model. There is also a strong business funded lobby in Scotland for water privatisation. We should take inspiration from the people of Bolivia and elsewhere when we say our rain is not for sale. I was in Parliament this evening for a Nordic Horizons event. Nordic Horizons promotes discussion about the ‘Nordic Model’ which puts Norway, Sweden, Finland, Denmark and even Iceland at the top of almost every international league table for wellbeing, equality, health and productivity. Tonight’s discussion was titled - Is small beautiful - and if so, how does Scotland manage with the largest local government units in Europe? The first speaker was from the Swedish municipality of Gotland, an island in the Baltic with a population of around 57,000. They have done some impressive things with renewable energy including wind and biomass that is used to fuel buses and shortly even the ferries. The council set up the energy enterprises and benefits from the income as well as the environmental benefits. This inevitably led to a discussion as to why we don’t do more of this. Of course councils in Scotland used to own power companies. In fact in the 19th Century councils were given the statutory authority, not only to set up power companies, but even to municipalise existing ones. I suspect today most councils would decide to outsource the profits to a foreign owned energy company. The Norwegian speaker focused on the role of communes in rural Norway. There are 430 of these although many are under pressure to amalgamate. Again the spirit of municipal enterprise was present in addition to real civic engagement. I particularly liked the story of the local care home manager who was more concerned about local gossip about standards than any regulatory inspection. Real user engagement there! The general view was that we don’t have ‘local’ government in Scotland. Most Europeans living in Scotland can’t comprehend the idea of councils having a population of hundreds of thousands. The level of democracy in real local councils costs but it also improves the quality of decisions, generates new ideas and engenders a real sense of civic engagement. This is something sadly missing in Scotland, where the debate is how much bigger we can make councils and other public bodies. The narrow managerialism of most of our public leaders’ remains focused on economies of scale rather than revitalising our democracy. Whilst a case can be made for large city councils, Scotland has more than 100 towns that could be liberated through a new sense of civic pride. That’s the lesson of the Nordic model and one we should seriously consider. I was speaking at the Holyrood conference 'The New Economic Reality' today in Edinburgh. There was a very good range of speakers for this event with a focus on ideas, rather than a sales pitch from contractors peddling privatisation. An approach all too common at conferences like this. The Permanent Secretary, Sir Peter Housden kicked off the conference with a broad overview of the future direction for Scotland's public services. He is fairly new in post and therefore it was interesting to get his take on the position in Scotland after running an English department for a number of years. As you would expect there was much about the opportunities as well as the threats. I suspect most frontline staff facing the savage cuts would receive all this with a large degree of scepticism. However, in fairness he appears to have a good grasp of the importance of people in delivering change, rather than simple number crunching, systems etc. A recognition that people come to work to do a good job and a committed workforce can make a difference. The Auditor General, Robert Black gave us the numbers and the predictable plea for more information to drive change. I am always sceptical about the benefits of this when you see how much staff time can be diverted from service delivery to collate this data. Much about co-production and user engagement from three different speakers on reshaping public services. There was a helpful recognition that this is what many public service professionals, like social workers, do every day. Plus an understanding that it takes time, effort and resources to develop meaningful engagement and even longer for co-production. In a session on delivering more with less we had Sue Bruce the new Chief Executive at Edinburgh Council. Sadly, a predictable enthusiasm for alternative delivery models including some woolly talk about social enterprise. Pity she wasn't at the morning session to hear Peter Housden talk about evidence led policy, because she certainly didn't offer any. She wondered why staff seem reluctant to offer innovative ideas. Well if you promote outsourcing it doesn't show much confidence in your staff, so they might not have much confidence in you. She was followed by an instructive history lesson in public service reform from Eddie Frizzell and an entertaining, if not particularly informative, presentation from Barry Quirk. He has the resplendent title of Local Government Efficiency Champion at SOLACE. Finally my own contribution on engaging the workforce. I started by questioning what the new economic reality was. With a pay freeze, job cuts, attacks on conditions and pensions at a time when the bankers who caused the mess are paying themselves massive bonuses - please don't tell staff 'we are all in this together'. I ran through the conventional approaches including outsourcing, shared services and expecting the voluntary sector to pick up the pieces. If the tax dodging accountancy firms and their big corporation clients think the Cayman Islands is such a great place to do business, then why don't they seek public sector contracts there instead of Scotland? I explained the difference between the market realm and the public realm. The market realm plays by different rules and they don't share our public service service ethos. A new generation of senior public service managers have to relearn the lessons of the 1980's. As one council manager who found this out the hard way said to me recently; "these people are not your friends". I also pointed out that there are no new ideas - just the old ones rehashed. I recently did a session at a US conference (by video link) and was preceded by a US management consultant extolling the benefits of insourcing! Backed up by case studies of US companies who are abandoning outsourcing for many of the reasons we talk about every day. I was negotiating shared services in the private sector ten years ago and only now are they discovering the real transaction and displacement costs. Finally, I set out a new approach to public service delivery based on integrated service delivery, as local as practicable. An approach that views delivery from the service users perspective, not top down centralising promoted by many under the guise of economies of scale. An effective change process has leaders who give staff the freedom to design the service they deliver and give them the space to do so with a degree of job security. Encouragingly, there was a significant degree of consistency from the better speakers on this type of approach. Not quite a consensus yet as old approaches were also in evidence today. But some hope that we can develop a different approach in Scotland that reflects our public service ethos. ﻿Yesterday, survivors and relatives joined dignitaries, MSPs, councillors and church leaders, at a service to remember the 70th anniversary of the Clydebank Blitz in an act of remembrance and forgiveness. The town was flattened on 13/14 March 1941 by the Luftwaffe as they targeted shipyards and munitions factories leaving 528 dead, 617 seriously injured and more than 35,000 homeless. Only seven houses remained untouched. There will also be a minute’s silence today in Clydebank shopping centre. One of the guests at the service was the Consul General of Germany, Wolfgang Moessinger. This reflects the fact that the Luftwaffe was directed by the fascist regime of Adolf Hitler. A regime that also murdered many thousands of Germans, most appallingly in the concentration camps. This is not just a history lesson. We have modern day fascists in the form of the BNP and EDL whose members have been easily identified with Nazism through its extreme and provocative activities, associations and publications as well as its active denial of the facts of the Holocaust. The BNP today likes to portray itself as a simple nationalist party. However, while the BNP has attempted to distance itself from its past it remains a racist party in the European fascist tradition. I can’t recommend it as a good read, but this is clear in the ramblings of the Scottish BNP ‘leader’ Gary Raikes. Recent divisions and expulsions have clearly taken their toll on what always was a tiny organisation. Most of their activity is obviously organised from outside Scotland. For example, the BNP Scotland blog seeks donations for their ‘Assembly’ election campaign. Message to the Fuhrer bunker – that’s Wales not Scotland! They will no doubt stand candidates in the Scottish elections, not because they expect to be elected, but rather as an opportunity to spread their message of hate through the election free post. This is important because Scotland is not exempt from racism. In a report published just yesterday the EHRCS said there were "record levels" of racially motivated crime recorded in Scotland, with more than 6,200 incidents recorded between 2009 and 2010. So whilst we remember the tragedy of the Clydebank blitz, let’s make sure that the perverted ideology that caused it doesn’t take root in Scotland. Good to hear some louder voices at the CoSLA conference and in the media this weekend making the case for democratically accountable local government. I was concerned that local government organisations like CoSLA felt that there was no need to state the obvious. How wrong can they be. With one centralising proposal after another there is a risk that local government could control a tiny proportion of public spending as the national this, that, or the other takes over. Added to that we have all the political parties ruling out increases in the Council Tax, leaving councils no freedom to respond to local need. Other than increasing charges - the most regressive of taxation measures. James Hunter put it well in his comment piece in the Herald on Saturday: "Scotland may be a small country. But it is an endlessly diverse one - the sort of country in which a thousand flowers could be encouraged to bloom by ministers committed to dispersing power rather than hoarding it." I note in this week's Third Force News a bizarre proposal to do away with councils altogether. Apparently this would mean one less layer of government and councils would be replaced by community bodies getting together to debate issues. Norway is cited as an example of this. Strange given that Norway has 430 elected local councils and 19 strategic authorities - one more layer of government than us. I belong to a number of community and voluntary organisations. If I don't like what they are doing I can either work hard internally to change them, time I sadly rarely have, or I resign in protest. I can't resign from having my bins collected and thankfully neither can my neighbours. Rats don't respect our boundaries! Even the uber capitalist Victorians recognised this when they created local government. Democracy does of course mean much more than electing councils every four or five years. Engagement with community organisations is vital. However, that is no substitute for elected democracy. It may not be perfect, but I want to able to tackle my local councillor and vote him or her out when needed. That's real democracy. This morning we had sight of the long awaited report by Lord Hutton on public service pension schemes. As expected he is recommending long term structural reform of the schemes that involve more than one in five Scots. The headline recommendation is a shift from final salary schemes to one related to career average earnings. This is not a problem in principle so long as the overall value of the benefits is not reduced. A key issue is how each year's accrual is indexed. John Hutton is recommending that this should be done by average earnings and this is likely to be a reasonable basis for negotiation. However, we wait to see what the UK Government reaction will be to this proposal given their obsession with the CPI for indexing. Reform should be on a scheme by scheme basis because the membership varies considerably. Scotland's pension schemes have been the subject of major reform in recent years and already have cost sharing principles built in along with many of the reforms recommended in this report. We would agree with the report's recommendation that there should be stronger governance and member involvement in running pension schemes. The commitment to honouring in full pensions promises already paid for by scheme members is of course welcome. How this fits with the Con-Dem coalition's decision to index benefits through the CPI rather than the RPI is less clear. Staff have paid into the scheme all their working lives only to find benefits slashed by over 15% when they retire. Many of the recommendations in the report fall under devolved powers, although the Con-Dem government is using financial levers to pressure Scottish Ministers. Lord Hutton is recommending overarching primary legislation to set a framework. It remains to be seen how restrictive this framework would be and the consequential impact on devolved responsibilities. For example there are no changes proposed in this area in the Scotland Bill. Lord Hutton is undoubtedly sincere when he states that he wishes to avoid a 'race to the bottom' in pension provision. His report has also done much to dispel the myths around the 'gold plated pensions' promoted by the right wing media and Nick Clegg the Deputy PM. However, the Chancellor's decision to use Lord Hutton's interim report as cover for contribution increases of 3.2% has fatally undermined his report. The £375m raised from Scottish public service workers will go straight into the Treasury - not the pension schemes. This is little more than a tax on scheme members and will result in further opt-outs from the scheme, placing new burdens on welfare benefits. I have spent a lot of time talking to members about pensions in recent years. Politicians at all levels should be left in no doubt that public service workers will not tamely accept this daylight robbery of their hard earned benefits. Today I submitted our response to the Scottish Government consultation paper Building a Hydro Nation. This consultation sets out a big vision of an expanding role for Scottish Water. Moving into renewable energy, research and international development. The paper makes it clear that ownership is not a consultation issue. Despite the well financed big business lobby for privatisation the public service model still enjoys widespread public and political support in Scotland. Labour and the SNP understand this - the Tories and the Lib-Dems are stuck in the 1980's with their support for privatisation. This consultation reflects a growing understanding that not only is water and sewerage an essential public service, but that given the global water crisis, it is one of Scotland's greatest assets. This does not mean that we should cling to the status quo. The water trades unions have published a paper, It's Scotland's Water, that highlights other public service models that demonstrate that a more democratic structure can deliver a more efficient, socially responsible and more accountable public water service. It is in this context that we believe that a new governance model, a water agency, is needed to take forward this vision for Scotland's water. This approach would have the added benefit of abolishing the expensive nonsense of the economic regulatory framework, including the Water Industry Commission. The leaders of this organisation have actively lobbied against the vision described in Hydro Nation and a new democratically accountable water agency should replace it. The consultation paper has a strong international vision. This fits in well with the developing worldwide Water Network which aims to strengthen the resistance against privatisation and commercialisation of water. The common theme is to develop more democratic forms of ownership that ensure there is a focus on the issues that matter to the public like leaks, repairs and water quality. Not creating an artificial market that concentrates on profit rather than service. Scotland should be a world leader in that network. The Information Commissioner for Scotland, Kevin Dunion today published his annual report. More than 1000 decisions made since he took up his post have made a huge difference to the culture of secrecy that used to pervade public service. There has been an increasing use of FoI with 73% of public authority respondents reporting that FOI requests had increased in the last year, with 38% stating that they had increased 'significantly'. Freedom of Information legislation has been vital in improving democratic accountability. It is a key tool for members of the public, journalists and campaign organisations like UNISON. An example of how we use FoI was included as a case study in this year's report. This involved our annual survey of violence in the workplace. The information gathered has helped to develop best practice guidance and better protection in the workplace. One of the most disappointing recent decisions was the outcome of the Scottish Government consultation on extending the FOI Act. The aim was to cover a range of additional bodies that provide important public services, including the Glasgow Housing Association, the Association of Chief Police Officers in Scotland, private prisons, leisure trusts and PFI/PPP contractors. In January 2011 the Government announced that it would not be taking designation forward, a craven capitulation to business lobbying. The Commissioner rightly criticised that decision and points that that there is a real risk that we could fall behind other countries when our FoI regime used to be a world leader. Lets hope a new Scottish Government after May will take a different view and build on the excellent work the Commissioner and his staff do. First of our election hustings yesterday at the police staffs seminar. The format is an introductory speech from each of the party justice spokespersons, followed by questions from our members. A good turnout from the main political parties with the exception of the Justice Secretary, Kenny MacAskill who cried off on the grounds that the event was 'political'. And the Justice Secretary is not 'political'? I suspect he was more concerned that his cosmetic '1000 police officers' might come under a bit of scrutiny from staff who understand only too well what this really means. Central Scotland MSP Christina McKelvie, stood in for him and did her best. 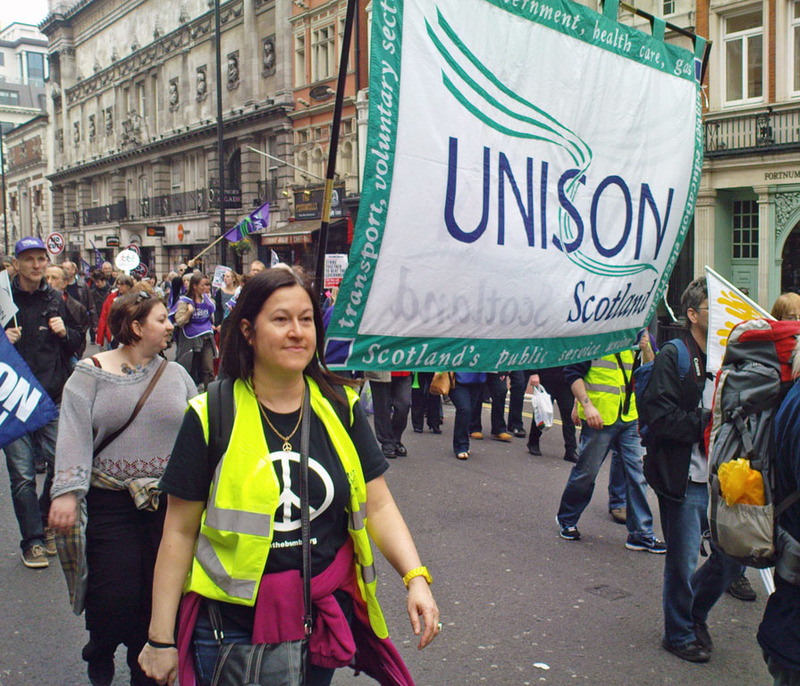 Christina is a Unison member with a background in social work and, whilst not on her subject, had at least done her homework. More than can be said for the Justice Secretary! The audience were also pretty sceptical about the national police force, supported by Labour and the SNP. In particular about the claimed savings, a point Richard Baker struggled with. He was on stronger ground with Labour's position on police staffs generally and privatisation. The new Tory justice lead, John Lamont, clearly had a crash course in policing following Bill Aitken's resignation, but his support for privatisation went down like a lead balloon following the Group 4 nonsense a couple of weeks ago. Lib-Dem, Robert Brown was on stronger ground with his support for localism, although as the party jointly responsible for the cuts he had some convincing to do. Patrick Harvie played well with an audience that are perhaps not a natural fit for the Greens. The questions from the floor were excellent, often put over with a real passion from staff who are not normally at the forefront of UNISON campaigns. Police staffs have a wide range of concerns and they have not been slow in recent months in getting stuck into politicians. So candidates in the election have been warned. Police staffs will be coming to a hustings near you! Yesterday I participated in a seminar in Parliament organised by the Finance Committee on preventative spending. They produced an innovative report that identified investment in public services that would result in long term savings and tackle some of Scotland's most intractable social problems. The focus was on early years interventions. Suzanne Zeedyk from Dundee University's Department of Neuro Science explained how 90% of brain mass is determined by age 3. The brain is driven by emotions not behaviours therefore how we relate to babies is crucial to child development. Alan Sinclair from the Work Foundation reinforced this message by pointing out that a series of apparently intractable problems are actually all the same. It's how we bring up babies. This means that preventative spending on early years will pay big dividends in the medium to long term. Intensive support to teenage mums, family centres, health visitors and continuity in fostering and adoption are all crucial. There is strong evidence from Finland and Holland to show that this approach works. In those countries there is cross party support for this approach. Depressingly, in the USA the Republicans want to cut nutritional subsidies to babies. The challenge of course is how you join up services to focus scarce resources on this key group. Not to mention shifting cash from existing services. My only reservation about the debate is that there was insufficient emphasis on the importance of reducing inequality. Poor family relationships are often driven by poverty. It is not an accident that more equal societies do better on every measure. Excitement in some papers yesterday because the pilots for direct elections to health boards cost £1.6m. 'Shocking', say the usual suspects, this could have paid for 64 nurses. Sorry, but no it wouldn't. You would have hoped that the difference between recurring and non-recurring expenditure would have been understood, at least by serious health organisations. However, the BMA and RCN always opposed the extension of democracy to the NHS, so this was predictable enough. Their evidence to Parliament when the Bill went through reflected a very top down, professionals knows best, attitude to patient involvement. “I believe this represents good value for the kind of democracy that puts people at the heart of the NHS. It is a reasonable price to pay for making sure local communities are at the heart of local decision-making." Yes of course the NHS is facing cuts but that is not an excuse to abolish democracy. In fact when difficult decisions have to be taken we need more democracy, not less. The Scottish Parliament elections cost £40m to administer. Parliament correctly decided to separate council elections from the parliamentary elections for sound democratic reasons, despite the additional cost. It would of course be much cheaper to have a system of regional governors for local government or even a High Commissioner for Scotland. However, I haven't seen a Herald Editorial calling for that in these straightened times. Democracy is rarely cheap but it is the bedrock of our way of life. One third of Scottish expenditure goes to NHS Scotland. Sums of that magnitude deserve democratic oversight. Just back from two days in London looking at our pensions campaign. Useful to get a UK perspective as most of the attacks on our members pensions come from the UK Government. The big one is the plan to increase pension contributions by 3.2%, grabbing £2.8bn, not for pension funds but for the Treasury. For Scotland this means around £375m being raided from the Scottish Government budget. This includes £140m from local government and further £140m from health. Then we have the indexing switch from RPI to CPI that will take another 15% off benefits. As a member about to retire put it to me today, "you pay into a pension fund all your working life only to have the government steal the benefits at retirement". That's exactly what it is - robbery. Another interesting pension story today was the publication of PCS's monthly index showing the funding position of all UK private sector defined benefit schemes. This revealed an improvement in fund deficits to £64bn as at February this year from £144bn in February last year. The FTSE100 firms saw their combined scheme deficit also improve from £58bn at the end of February last year to £32bn this year, while the FTSE350 deficit also improved from £68bn to £38bn over the same period. This shows that you need to take a long term view of pension investments and not panic everytime the market takes a dive. However, PCS have also highlighted "very difficult" times for Defined Benefit schemes - particularly with tax changes expected in April and the recent government proposals on contracting-out, which represent a highly penal tax on DB schemes. It seems that the Con-Dem coalition is determined to close down quality pension provision, leaving us all in poverty during retirement.